Social media is definitively changing mentorship! In today’s digital world it is very easy to connect with people you admire and who can change your entrepreneurial path. This story is about one amazing Community Manager, Marketing Consultant and Content Creator who was hiding just a click away from me. In the beginning, I admired him and his activity from the shadows. After knowing him better I’ve discovered that we have in common 3 awesome passions: coffee, beaches and checking off activities on our bucket lists. That was the moment when I knew that I didn’t just admire him, but I also needed to ask him the big question: “Will you be my mentor?”. Of course, he said yes and the rest, as they say, was history! Our first conversation started over a coffee, about coffee, our common friend. We both agreed that drinking coffee is making us happier, more efficient, and it is one of our favorite drinks that is associated with so many great memories and friends. For him, coffee is one of those incredible pleasures in his life that he just can’t do without. Also, he is in love with beaches from all over the world because he is convinced that these are the only places that offer endless amounts of relaxation. The beautiful scenery that beaches are offering helps us take a break from reality. Watching the sun go down over the sea is simply breathtaking and inspiring. It makes us stop worrying about deadlines, meetings, calls, because it gives us this feeling that the time has stopped for a moment and we are so blessed to be an actor in such an amazing spectacle offered by nature. Actually, we are definitely one step close closer to Heaven simply by feeling the sand on our feet and watching the endless ocean horizon. I admire him because he is brave enough to explore the entire world for the beauty of it while listening to Frank Sinatra, Dean Martin or Tony Bennett. What would life be like without music? “Without music, life would be a mistake” said Friedrich Nietzsche. Life would also be dark, cold and silent because music is such a beautiful and powerful way to escape the reality we live in and to put a smile on someone else’s face. Since music has always been a huge part of his life from a very young age, I chose for our shared interview Frank Sinatra’s most beautiful space-themed song, “Fly Me To the Moon”. 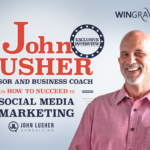 It is my great honor and pleasure to introduce to you John Lusher, the social media entrepreneur who loves to drink coffee and to travel to the beaches of the world! He is helping us to achieve the next level in social media. 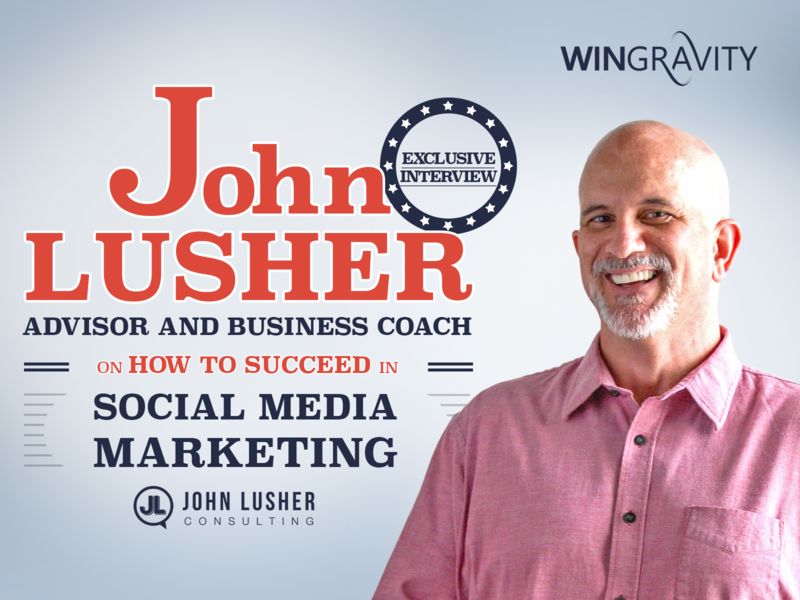 As of September 2017, he is the Advisor and Social Media Coach of WinGravity. I had a lot of fun interviewing John. I’ve learned a lot from this conversation and I’m happy to share it with all of you. John: The first impression I had of you include the words whirlwind and driven! You struck me as someone that has a ton of projects going on and you are passionately committed to each one of those projects. I could tell from our first conversation that your drive was natural; as with most entrepreneurs, the drive to succeed, to build your business and to make an impact comes from deep within. C: You are known around the world as the Entrepreneur who loves coffee and traveling to the beaches of the world. How does that work with being a Community Manager, Marketing Consultant and Content Creator? J: I think they work very well together!! My internal drive pushes me to accomplish more and take on more; all of that work is fueled by my love of coffee and most coffee products! One of the BEST things about being an entrepreneur and working in marketing/social media is that I can do that work from any location. Home, on the road and yes of course, while at the beach. I’ve designed my business to be mobile, meaning I can work virtually anywhere while enjoying my life. C: With that in mind, what’s the number one priority for a successful entrepreneur in using social media? J: Be authentic. Hands down, be authentic. Many people have a social media persona that is different than their personal persona, and that is a mistake. Just be yourself; we are all human; we all make mistakes and have bad days, but that is what makes us real. To our audience, clients, everyone we interact with or who may observe us from the shadows, they want to see real people. J: Yes and no. Haha! It is the best and worst job ever! Actually I wouldn’t say it is THE worst job ever, but there are times it can be challenging and frustrating. When you are the entrepreneur, it all falls on your shoulders. Of course we love that, but that can also be tiresome at times. The way to fight against burning out from the responsibilities is to surround yourself with a terrific team and support system. C: What is your biggest achievement in social media? J: Oh wow, what a great question! I think being published on various websites as well as building a name for myself on social. All of my clients have come to me through social media. To me, that is a major accomplishment. J: I’m not sure I would change anything, per say, but I may focus on specializing more on certain areas of social and marketing. J: You can’t do it all. While we all want to and think we can, that is not true. We need team members, mentors, people we can delegate things to; this will serve all entrepreneurs very well. The other advice I would offer is to listen to those who have come before you. They have been in your shoes and can offer valuable information. J: Not really a secret formula, but tying back to being authentic and just being consistent. I’ve been active on social almost every day for nearly ten years. It shows people you are real; that you are dependable and may be able to establish yourself as someone that others can turn to as a thought-leader. C: You are the coolest and the best entrepreneur ever who loves coffee and traveling to the beaches of the world! I have no doubt that everyone will want to meet you. So, please tell the readers how they can reach you. J: You are way too kind! Thank you! You can find me all over social. Some accounts are entirely industry/business related, others are a mix of business and personal. I truly believe that mentorship is the key to success for any business and a great mentor can make a difference at the exact right moment. The wisdom and the valuable lessons that come from these amazing and altruistic professionals like John are invaluable. Now I can say that he is not just a nice guy, but a true help and friend who has experienced the highs and lows of running a business. 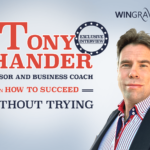 Not only does he have the right words to share, but also lots of ideas that are helping me to navigate my way to success. Lesson learned: In hard times, having a mentor support you helps you keep your head up and be untouchable. These amazing people have the capacity to help entrepreneurs increase their self-confidence and see every challenge as an opportunity and each failure as a lesson learned.